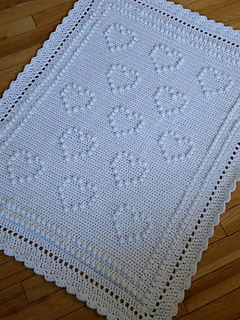 Delicate hearts incorporated into the stitches worked in rows to make this beautiful baby blanket. 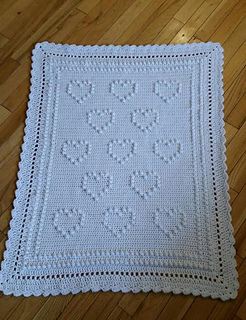 The pattern is a chart and all instructions are included to help you achieve this blanket. The pattern is easy and works up fast. If you have not worked from a chart before, it is very easy to follow. 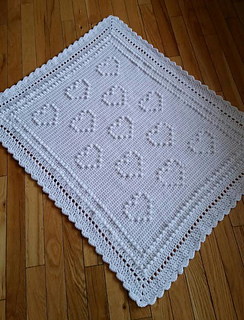 Each pink block on the chart will be a popcorn stitch and each white block will be a single crochet, as simple as that. Instructions are given explaining how to read the chart and instructions are also written for the border rounds.